Authorities declared a state of catastrophe in central Chile yesterday as crews fought vast forest fires described as the worst in decades. More than 450 sq km were ablaze in the O'Higgins region - an area roughly the size of Vienna. 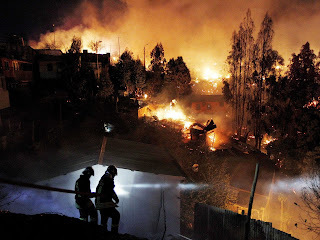 As fire and emergency crews were brought in, officials evacuated 200 people from the mostly rural area south of the capital Santiago. Some 30 homes were affected in Cardenal Caro and Colchagua provinces, the National Emergency Office (ONEMI) said. A local ONEMI official, Josefina Lopez, said that no one was hurt but there was economic damage.